Sonya Battla is one of the well-known fashion designers, who started offering clothes for women many years back. 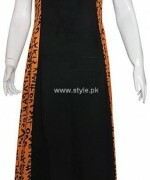 The designer offers fantastic and quite stylish clothes especially for women. The clothes in the collections of Sonya Battla have unique styles and innovative patterns. Most of the clothes by Sonya Battla give a very unique and stylish look. The designer is now recognized globally for women’s wear. Ger dresses have been seen numerous times on the ramp and in fashion magazines. In fall 2012, we saw Sonya collection at FPW 2012. The clothes of the designer are such that they are great for all women no matter what their age. The dresses of Sonya Battla can be bought from her outlet in Karachi. You can see the pictures of Sonya Battla casual wear collection 2013 for women below. The pictures of the dresses are given here. For more details on the dresses and getting to know how to get the dresses, just go to its Facebook page. The address of the Facebook page is provided over here. You can certainly get more information about the brand there. If you would like to get any of the dresses, just go to the store of Sonya Battla. You will most probably get it there.